A friend has a wedding to go to on Saturday. 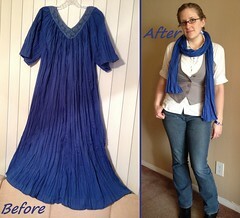 Her husband is a groomsman, and the primary color for the wedding is royal blue. So my friend wanted some blue accessories to pair with a black and white dress to coordinate with her husband's wardrobe, a black suit with a blue vest. 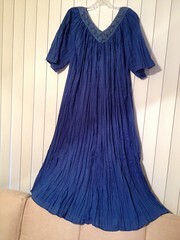 Enter me and this muumuu from Goodwill. 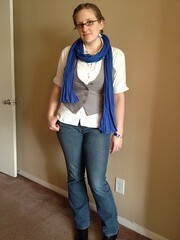 I simply cut off the collar and sleeves, and cut straight up the sides, center front, and center back of the body. With the sleeves tossed onto my scrap pile for possible later use, I was left with four long pieces of fabric with a diagonal edge at the top (where the collar used to be). I sewed two of these pieces together end-to-end with the diagonal edges lined up, using a french seam so there would be no right or wrong side of the scarf. 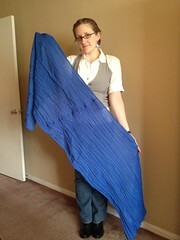 Then I hemmed the edges. I used the other two pieces to make another scarf for myself! With neckwear checked off the list, now we had to address the jewelry situation. 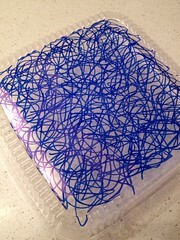 I had a clear plastic to-go container from a recent office luncheon, and it just happened to be #6 recyclable plastic. 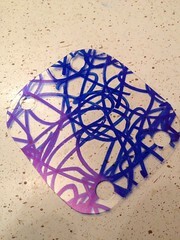 I knew just what to do with it - Shrinky Dinks! My container had my initials written on top in blue Sharpie as it had been placed in the office fridge after the luncheon. So I just went with it and scribbled all over the top and bottom of it. Then I cut each of the flat portions into nine pieces. Next, I rounded my corners and used a hole-punch so I would be able to join them together afterward. Trust me, it's a lot easier to punch holes now than it will be once they've shrunk and they're several times the original thickness. 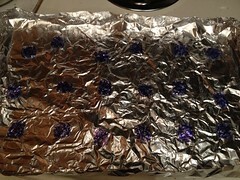 I lined them all up on my aluminum foil tray and popped them in the oven for a couple minutes. My squares that were originally about 2 to 2-1/2 inches on each side came out roughly 3/4- to 1-inch squares. 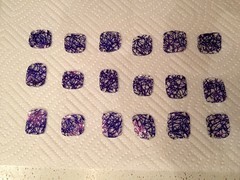 You can see them a bit better on a white paper towel. Now, I've used this tutorial before and remember that last time my design rubbed off very easily. 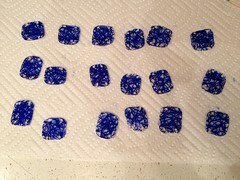 So I decided this time to seal them with some clear nail polish. Turns out, the act of brushing on the nail polish smeared the marker a bit, but I actually like it better. 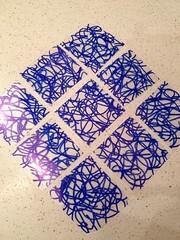 After shrinking, the blue Sharpie was concentrated into a navy blue, so smearing it brought it back to royal blue. Of course, if this wouldn't have been such a happy accident for you, you could maybe try some clear spray paint to seal them instead. Perhaps that wouldn't smear your design. Finally, I grabbed my jewelry findings - some jump rings, clasps, and earring wires - and got to assembling. 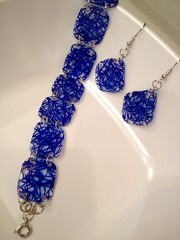 Again, I had enough to make two bracelet-and-earring sets, one for my friend and one for me! Thank you!!! Wonderful post and wonderful blog!! God bless!! No problem! I'm not sure if Gladware is the right kind of plastic though. Check for the "6" in the recycle triangle on the bottom. If not, lots of to-go containers from restaurants and grocery store delis are the right kind. Does the plastic smell when you bake it? No, I haven't noticed any smell at all. 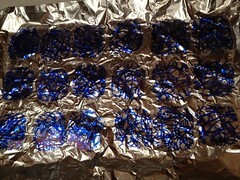 If you go to the link for Shrinky Dinks that I included in the original post, it recommends a temp of 350 degrees.